Obsessing over Hanna and John’s winter wonderland wedding theme? 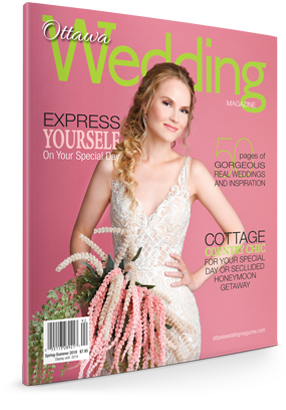 While it was hard to narrow it down, we’re sharing five of this couple’s favourite elements that made their wedding day truly magical. A surprise father-daughter trip to New York led this bride to find her dream dress. “He had always helped me pick out all my dresses, and it was always my dream to go wedding dress shopping with him.” With the help of her father, Hanna selected a romantic sheath gown by Sottero and Midgley with an illusion neckline in the front and a shimmering back sprinkled with Swarovski crystals and pearls. 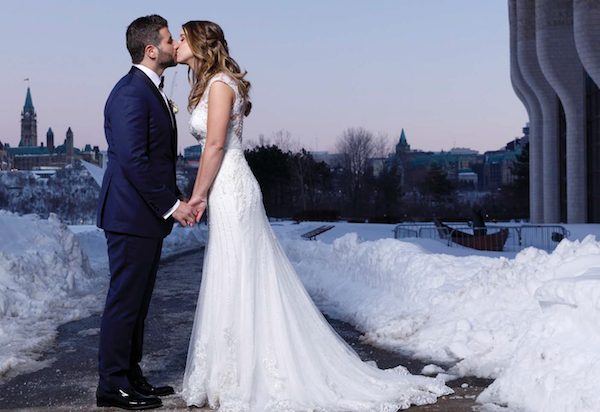 The bride said yes to the dress at New York’s RK Bridal, but would come home to order the gown through Sinders Bridal House in Carleton Place. For your very own winter wonderland dream dress, check out www.sindersbridal.com. cozy plush fleece blanket ordered from IKEA and embroidered with the newlyweds’ initials. “We wanted a fun and unique way to say a special thank you to our family and friends for attending our wedding. They were accompanied by a sign that read, ‘To have and to hold in case you get cold.’” Dog lovers also received a burlap sack tied with lace and filled with dog treats for their four-legged friends. To create your own unique embroidered gift, check out www.thesamgroup.ca. A winter wedding just wouldn’t be complete without cozy accessories. Hanna selected chic shawls for her girls, which were the perfect addition to an outdoor February photoshoot. 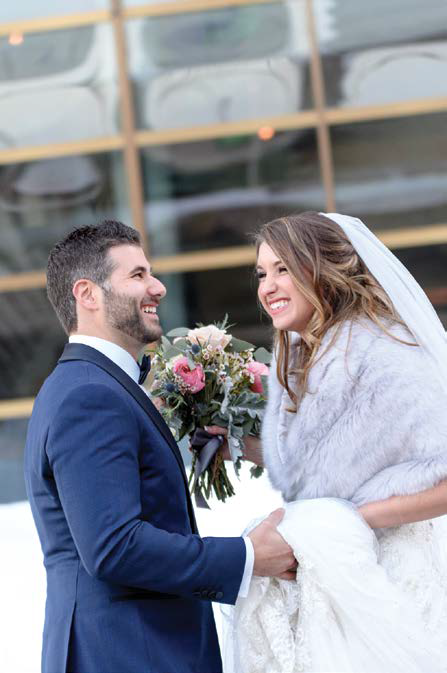 “I purchased the material from C&M Textiles, and one of the bridesmaid’s mothers, and great family friend, Fran Marson, custom-made our shawls.” To complete your winter bridal look, check out www.cmtextiles.com. On her wedding day, Hanna wanted her bridesmaids to know just how much she appreciated their love and support. 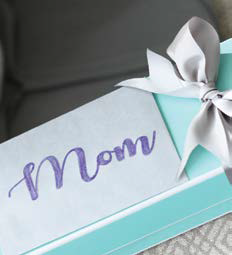 And what better way to say ‘thank you’ than with a cute blue box with a white bow! Each girl received a heart tag bracelet from Tiffany & Co. — the perfect accessory to complement each gown. “It is a simple and timeless piece that brought all of the girls’ mismatched dresses together. Needless to say, they loved it!” Check out www.tiffany.ca to find your own jewelled treasures. 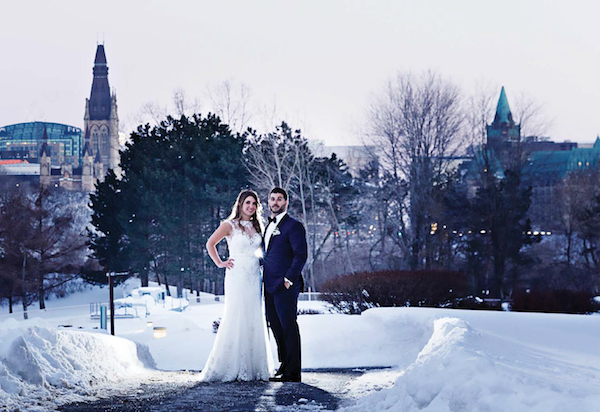 Winter Wedding Inspiration: Baby It’s Cold Outside!